An irregular, rapid increase in heartbeat is frequently caused by menopausal hormone changes. Women going through menopause may commonly experience an irregular heartbeat, which is known as arrhythmia, or a rapid heartbeat, which is known as tachycardia. An irregular and rapid heartbeat in some cases is harmless, and in others it can be a serious problem. This is why it is important to not only take steps to relieve a rapid or irregular heartbeat for your own comfort, but to also make changes to address underlying causes that trigger an irregular or rapid heartbeat. Putting pressure on your eyes with your hands or fingers and pressing down gently can help relieve a fast or irregular heartbeat. 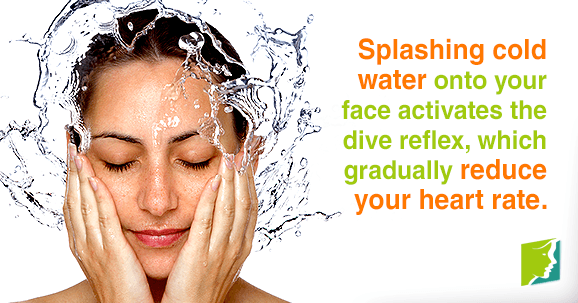 Splashing your face with cool water may also help. Deep breathing can help regulate a rapid or irregular heartbeat. Take slow, regular, and deep breaths that originate in the abdomen. A carotid sinus massage is done by a doctor, is noninvasive, and usually only takes a few minutes. The carotid sinus is part of the neck that is sensitive to blood pressure changes and massaging this area can be used to diagnose irregular heartbeats. This is just one method to diagnose an irregular heartbeat, and although irregular heartbeats are usually no cause for concern, your doctor may prescribe you medication to help or recommend lifestyle changes. Smoking and other forms of tobacco can contribute to a rapid and irregular heartbeat. Smoking is the number one cause of preventable disease and death. Smoking contributes to the buildup of fat and plaque in the heart and causes the normal lining of the arteries to deteriorate. Excessive alcohol consumption is never healthy, and if you drink excessively, you should take steps to cut back. Moderate alcohol consumption is safe and can be healthy. However, moderate or even minimal alcohol consumption if you have an irregular heartbeat, family history of heart conditions, or uncontrolled high blood pressure. It is important to limit caffeine intake, especially if you are sensitive to caffeine. A healthy diet includes a wide variety of fruits and vegetables, whole grains, lean protein, seafood, legumes, and low-fat dairy. A healthy diet includes minimal processed foods. Maintaining a healthy diet will not only help an irregular, rapid heartbeat, but will be beneficial for your overall health. A rapid and irregular heartbeat is a common symptom of menopause. However, there are different causes for a rapid and irregular heartbeat, some of which are serious, so it is important to seek medical attention if you are not sure what is causing yours. Click for further information on how to deal with this menopausal symptom. An irregular heartbeat can also be a sign of hormonal imbalance or menopause. Learn more.